Let's face it, a good mushroom risotto is a classic warmer for the colder months, and the cremier, the better. The traditional italian recipe often includes pork sausages and bacon, and definitely massive quantities of butter and grated parmesan cheese. However, here is a lighter, all vegan version of this easy to make, old classic. In a large saucepan, warm 2 tablespoons of olive oil on medium heat. 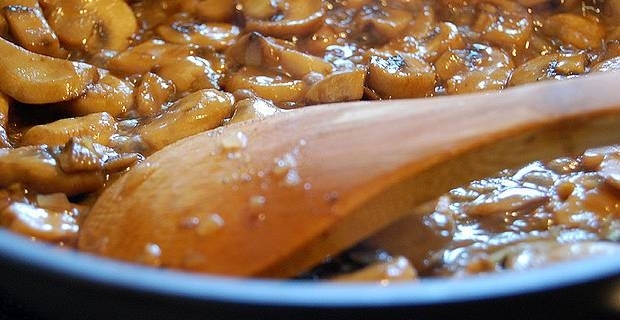 Stir in the mushrooms and cook for few minutes until soft. Pour the content into a bowl and set aside. Warm up the vegetable broth on medium heat. In the meantime, pour the remaining tablespoon of oil in a frying pan. Warm on medium heat, add the shallot and garlic and shallow fry for one minute. Add the rice and stir continuously for 2 minutes until pale golden, then add the wine. Keep stirring until the wine is fully absorbed. Remove the garlic, set aside. Remove from heat, pour in the content of the bowl set aside earlier, margarine and chives. Squeeze in the garlic cloves cooked earlier. Mix well, season with salt and pepper to taste. 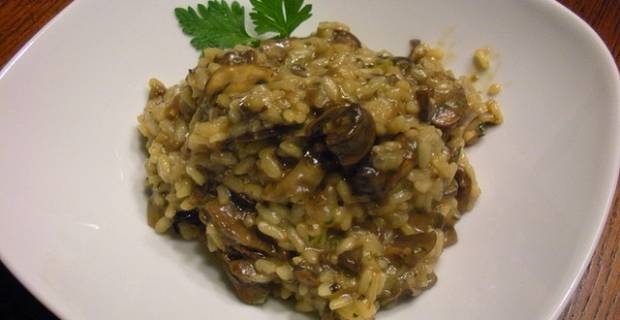 Button mushroom, oyster mushroom, shiitake or chinese mushroom... all are valuable substitutes for this mushroom risotto recipe. If you miss the cheesy parmesan taste, try adding some rehydrated dried porcini when cooking, or sprinkle in a vegan alternative to parmesan. You may even want to try it with yeast flakes instead, which would make your risotto even creamier. Bon appetit!